The list of thermal power plants in Vietnam having investment capital from China will be extended once Chinese investors are approved to take over Long Phu III thermal power plant located in the Mekong Delta province province of Soc Trang as per a recent proposal by the Ministry of Industry and Trade (MoIT). According to the MoIT, after the prime minister approved transferring the above thermal power plant from PetroVietnam to other partners to decrease the pressure on PetroVietnam to arrange investment capital to develop 11 other power projects, two Chinese investors - China Southern Power Grid Co., Ltd. (CSG) and a consortium of five Chinese firms including Zhejiang Energy International Limited and WIN Energy Joint Stock Company - expressed interest in taking over the project. Earlier, the MoIT also proposed the prime minister to assign Geleximco-HUI, a joint venture between Geleximco and Hong Kong United Co., Ltd., to develop Quynh Lap 1 plant, replacing the existing investor, state-run Vietnam National Coal and Mineral Industries Holding Corporation Limited (Vinacomin) as the MoIT was also worried about Vinacomin’s capacity to arrange investment capital. According to a report of the MoIT, there are 19 BOT thermal power projects with total designed capacity of 13,110 MW developed by international investors, mainly from the US, Japan, South Korea, Malaysia, Singapore, Thailand and China. Of these, Chinese firms hold the controlling stakes in three projects namely Vinh Tan 1, Vung Ang 2 and Vinh Tan 3. The US$1.75-billion Vinh Tan 1 thermal power project, which was put in commercial operation last month with output of more than 7.2 billion KWh per year, has been so far the largest Chinese-invested project in Vietnam in this field. Chinese companies are also the investors of many other thermal power projects, though they don’t hold a controlling stake in the projects. The US$2.1-billion Mong Duong 2 plant with a designed capacity of 1,240 MW in Quang Ninh province, for example, has three investors, the US-based AES Group - which holds a 51 percent stake - and Posco Energy from South Korea - which holds a 30 percent - and CIC from China 19 percent. 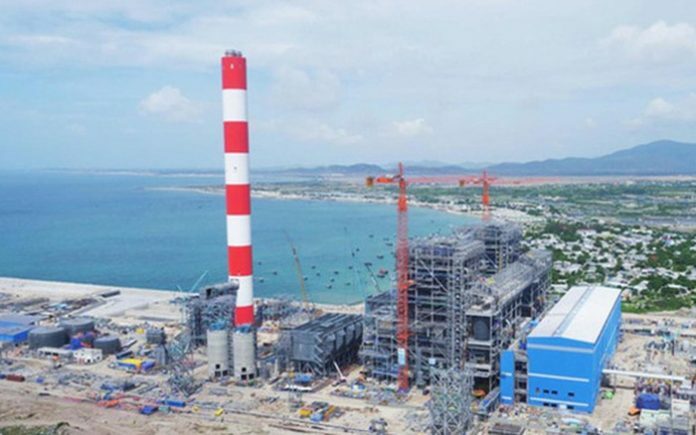 Under the prime minister-approved VII Power Development Plan, Vietnam will have 80 thermal power plants with total designed capacity of 24,370 MW by 2030, accounting for 45 percent of the country’s total power output. Experts said that it is still necessary to develop thermal power plants in Vietnam as renewable energy is not capable of replacing traditional energy sources for about the next two decades due to its low capacity, high investment costs and unattractive power purchasing prices. It is estimated that with the same output, the investment of renewable electricity sources is 3-4 times higher than that of thermal power. Besides, coal-fired power plants are considered as back-up sources when the weather is not suitable to generate wind and solar power. Truong Duy Nghia, chairman of the Vietnam Thermal Science and Technology Association, said that the advantages of coal-fired thermal power is low investment cost of some US$1,500 per KWh and cheap sale price of about US$0.7 per KWh, which are lower than hydro, solar, wind and nuclear power. In addition, Nghia said, coal-fired thermal power plants are capable of generating large amount of power and do not rely on natural factors as some other clean power sources. Nguyen Minh Due, chairman of Vietnam Energy Science Council, said that many countries in the world have no tendency to develop coal-fired power anymore because it is out of potential and especially polluting the environment. Meanwhile, Vietnam still has to base on the power source as it is very difficult for the country to meet the energy security in the current context when nuclear power projects have been stopped while wind and solar power capacity is small and depends on weather conditions. But the country must give top priority when deciding to develop coal-fired power plants, Due warned, adding that the country should accept expensive prices to invest the plants with modern technologies and avoid outdate ones, especially those from China.